Long before Rebecca Black made the song “Friday,” artists have been writing about the days of the week. An all-time ’80s classic is “Friday on My Mind” by Easybeats (betcha didn’t know the name of that band!). Clocking in at 95 rpm, it makes for a great fast flat…throw in some accelerations on the chorus and you’re set. 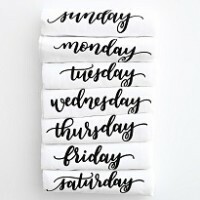 If you’re wondering what other songs make reference to the days of the week that you can add to your next profile, then download the playlist at the end of this post. I’ve listed a few of my favorites below if you’re looking for a few recommendations. Great for a flat road. Thank you so much. Defiantly interested in joining.